Drugs and drug-overdoses have long been a problem in prisons, since according to some estimates, as many as 85% of prisoners are incarcerated due to crimes related to their use or sale of drugs. 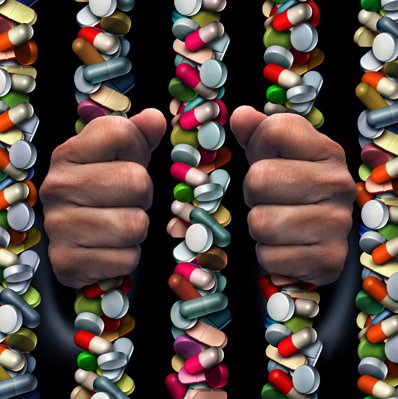 In fact, according to addiction medicine specialist Dr. Sarah Wakeman of Massachusetts General in an interview on "All Things Considered" on August 30, 2018, the rates of opioid and all types of substance use disorder are much, much higher behind bars. That's why criminal justice expert Paul Brakke, who recently published Crime in America with a chapter on prisons, was delighted to hear about a new approach in many U.S. prisons to provide inmates with medication for opioid use disorders or to give anti-overdose drugs to inmates leaving prisons. "It's an effective way to treat substance abuse in prisoners and to help inmates being released avoid a return to drugs," as Brakke states. In one of these approaches in Rhode Island, which has a $2 million state supported program, every new prisoner in the correctional system is screened for opioid addiction. Then, those who need it are given a medication assisted treatment (MAT), which includes the drugs methadone, buprenorphine, or naltrexone. Additionally, the correctional system established 12 community-based Centers of Excellence to continue the MAT therapy and provide support to released prisoners. "The therapy and follow-up support have proven effective," says Brakke, "since there was a 60% reduction in overdose deaths in the first six months of the program. There were nine of 157 fatal overdoses for recently released inmates in the first six month of 2017, a 5.7% overdose rate, compared to a 14.5% overdose rate based on 26 deaths in the first 6 months of 2016." According to Brakke, this approach is still rare in the nation's prisons, since most offer no medication-assisted treatment. But about 400,000 prisoners, 20% of the nation's 2.3 million inmates incarcerated for drug offenses, might benefit, as might any inmates using drugs in prison -- estimated at about 25% of the prison population. It also helps any inmates with a history of addiction to go on a drug program with methadone, Suboxone, or Vivitrol a few months before their release, because just-released former inmates have the highest risk of dying from an overdose. As Brakke points out, "That higher risk is because these ex-cons have a lowered physical tolerance for opioids, but they haven't lost their craving for it. In addition, besides taking the drugs, they should have the support of a peer-recovery program and better prescription monitoring." The other approach to reducing overdoses that Brakke favors is giving at-risk inmates the overdose-reversing drug naloxone to take when they or those around them think they could be in trouble. Then, the drug can be administered with a nasal device. That's what's being done in Alameda County in California, in Chicago, in New Mexico, and in other cities, counties, and states around the U.S. For instance, in December 2018, Alameda began offering at-risk inmates the drug upon their release, and 56 of 78 departing inmates took the prison system up on the offer. Plus sheriff's officials have administered the drug Narcan to at least 8 inmates at the Santa Rita Jail. Given the success of these programs, Brakke urges their expansion throughout the United States, and he points out that these programs are consistent with President Trump's opioid initiative, announced in March. This initiative pledges to screen all federal inmates for opioid addiction when they enter prison and to facilitate Vivitrol treatment if they are released to residential community centers. In addition, the initiative calls for increased federal support for state and local drug courts to provide treatment to addicted offenders. So now, according to Brakke, there should be federal funds to support the program, and all states should pass their own legislation and funding for such programs to cut down on addiction and overdose deaths for both prisoners and ex-cons. He further suggests that prisoners might voluntarily participate in experimental treatments to test their effectiveness and safety before bringing them to the general public. Brakke's recommendations come after writing a series of seven books on the criminal justice system, including his most recent Crime in America, published by American Leadership Books, which includes a chapter on the prison system. The book discusses the major parts of the criminal justice system, including the police, courts, and prisons. Besides Brakke's discussion of the opioid crisis and prison conditions, he has extensive statistics showing the relationship between reduced incarceration, lower recidivism, and rehabilitation for prisoners and ex-cons. In writing his book and working as a consultant, Brakke brings to the table a unique conservative approach to crime and criminal justice, since usually liberals discuss ways to reform the system through more of a social welfare approach. But Brakke's approachis more based on an economic business model of doing what works most efficiently to both cut down costs and create more productive citizens. To learn more, you can get a copy of Crime in America, which is now available through Amazon, Kindle, and major bookstores. It is currently available on Kindle at reduced price during its special KDP Select Promotion at https://www.amazon.com/Crime-America-Conservatives-Approaches-Criminals-ebook/dp/B07MKZG84Z. Also, free copies are available for government officials who are seeking ways to reduce crime and fix the criminal justice system and for members of the media at www.crimeinamericathebook.com.